Kids can enjoy drawing fun with this Crayola 3-in-1 Double Easel. It provides large work areas with magnetic/dry-erase and chalkboard surfaces. The Crayola 3-in-1 easel also features a large clip to hold paper and a spacious storage tray for art accessories. This item comes complete with 77 magnetic letters and numbers, an eraser for endless art fun. It also has a colorful design and folds up for easy storage when not in use. Children can arrange the letters on one side and draw with the chalk on the other. I bought this for my nephew who is about to be two and he enjoys it very much. Would definitely recommend. My son is 2.5 and he loves this easel. He loves being able to draw on the chalk board and place the alphabet letters up on the magnetic white board. I do have to watch him with the letter and numbers because they are small. If you are purchasing this for a child under the recommended age be sure to supervise them or just leave the letters and numbers in the box until they are older. Other than that this item is perfect and once my son is older the letters and numbers will be great. This has a spot to add a roll of paper, which I have not purchased yet, but I understand it can be purchased from Amazon for a good price. I reviewed many other similar products and found this to be the best value and had the most options for our needs. Very happy with my purchase! Excellent all around...the only small complaint I have would be the chalkboard...it is not a true chalkboard (like our old school kind)...it is like a laminate chalkboard so you are required to press down extremely hard on the chalk so that it is visible...I will primarily use the dry erase board during therapy sessions with the kiddos! Great for my nephew to learn writing. My mother and I bought this for my nephew for Christmas. He's get to the age he is starting to learn how to write, learning abc and numbers. This is perfect because it is his height. He can write with chalk, dry erase, color on paper, or play with magnets. 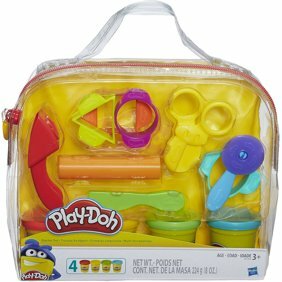 The perfect toy for learning! When I saw this product on special sale, I bought two, one for my great grandson and one to donate. My granddaughter had bought this 3 in 1 easel for my great grandson for Christmas so I knew that it was a special product before purchasing. The blackboard writes and erases well. The whiteboard is magnetic and the supplied letters and numbers stick well to it. We haven't used it for whiteboard writing yet so I can't review that. It is handy having the tray for storage. It is quick to put together and is very sturdy. It's a great purchase for a first easel for our two year old. He really enjoys. I highly recommend. My son absolutely loves it, he is 23 months old. I actually bought both the step2 double easel as well as the crayola 3-1. 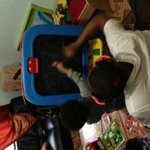 We are a step2 family having had several of their items for my kids. These easels are very similar with the step2 one being slightly more sturdier. We are keeping the Crayola easel because of the magnetic alphabets, eraser and the chalk. It came ready to use and my son couldn't wait, saved me some $$$ too. We will be giving away the step2 easel to his cousin. I bought this Crayola 3-in-1 Double Easel with Magnetic Letters for my 2 1/2 year old grandson for Christmas this year. He is going to love it. He loves playing with magnetic letters and he loves drawing with colors and markers, so I know he will love it. His parents are so excited, also, because they know how much he will enjoy playing with it. This is a Christmas Gift for my 2 and 4 year olds But When i got it in the Mail the other day I was Even more impressed then online! PROS: It Has the nice tray below for storage and its NOT light weight its actually pretty heavy. I love that it can allow my 2 older kids to play and not fight. Living in a state that rains 85% of the year lol its nice to have a fun indoor craft for them to do! CONS: ONLY bad thing is is its a dry erase board and a chalk board but it only came with 1 eraser(should have one for both sides) And it came with chalk and magnets and what not but NOT a single dry erase marker.... I would think if it came with chalk it would come with markers. other Then that LOVE it! I bought this and Step2 Easel for Two, both at the same time. But I liked Step2 Easel for Two better than Crayola 3-in-1. It is pretty good in size. The disadvantage of the product is that the frame is not sturdy and the body is not good finished. I can feel the roughness. The bottom tray is not too strong. The boards are OK. Overall not much satisfied. I decided to keep Step2 Easel for Two though it was $10 more than this. After all it was worth the price. 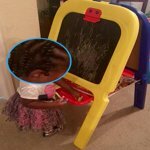 is one side a chalkboard and the other side dry erase board? 1. Yes, one side is chalkboard with a clip above to clip paper into, and the other side is a magnetic white dry erase board with a clip above it also. 4. That's correct, Heather! It's a 3-in-one easel so, one side is the chalkboard, one side is dry erase board and the other surface is the paper that's included with the easel. 6. Yes. one side also has a clip to hang paper on if they want to use crayons or pencils. Are both sides magnetic ? 2. No. The white/dry erase side is magnetic only. 4. Hi George, The whiteboard side of the Crayola 3-in-1 Double Easel with Magnetic Letters is magnetic; the chalkboard side is not. 6. No. One side is magnetic. The other side is used to write on with Crayola markers and can be cleaned off then. WHAT SIZE PAPER DO YOU NEED? 2. 8 x 10 is too small. You can use paper from a big drawing pad or the back of a huge coloring book. 3. 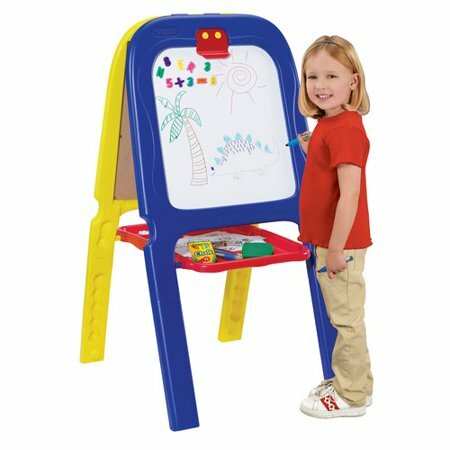 I buy the Melissa and Doug tear away easel pads. 6. 8x10 is too small, I'd aim for maybe 16x20 or a little bit smaller, not sure of the exact measurements other than the standard size printer paper is too small.